Hey everyone! Sorry for the lack of post yesterday...between hosting some company and having to work late, it was just one of those days. 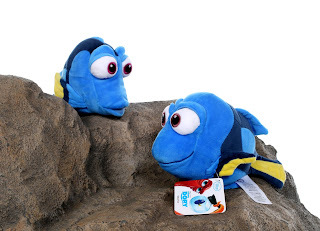 Today I'm making up for it though with not one, but two Disney Store exclusive Finding Dory plush: Jenny and Charlie, Dory's parents! 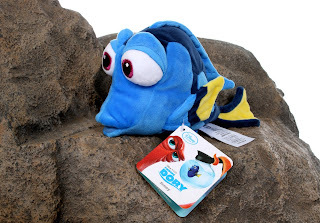 Note: If you've been following along, you'll know that I've been reviewing the entire Disney Store exclusive Finding Dory plush collection over the past couple weeks. If you haven't already, be sure to check out my other detailed posts featuring Hank, Mr. Ray, Crush, Nemo, Bailey, Baby Dory, Sea Otter, Marlin and the sea lion trio. And we're not even done yet—there's still more to come! 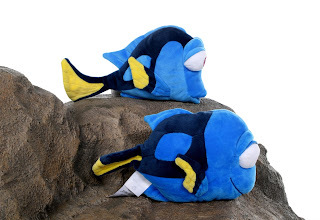 These two are classified as "mini bean bag plush" at the Disney Store (so, unlike the other "medium core" characters I've reviewed, these ones have the plastic pellets inside; they're also smaller). They're both about 9" long and are roughly 5" in height. Each one retails for $9.95. I think it's really cool that the Disney Store decided to release these characters, since there isn't a lot of Jenny and Charlie merch out there. Both look and feel great as usual (soft, nicely stitched, embroidered features, etc.) and feel quality made overall. Pretty good likenesses to the characters as well! Here's a funny story relating to these... Back before the film came out, we sold a TON of Jenny and Charlie plush at the Disney Store I work at. They couldn't stay on the shelf! The reason? 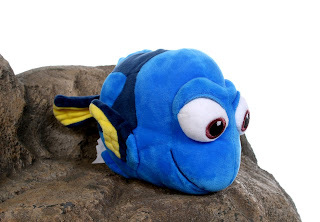 Not because they were popular characters (in fact, these characters were pretty unknown at that point), but because most of the guests failed to read the tag and thought they were Dory! I was lucky enough to get them for my birthday back in May, but they have unfortunately sold out completely in stores and on the Disney Store's website—so eBay/Amazon may be some of the only options at this point (check out current eBay listings for Charlie HERE and Jenny HERE). Best of luck! Be sure to share your thoughts on Dory's plush parents in the comments below. BoxLunch $100 Gift Card Black Friday GIVEAWAY!